As America’s oldest park, the Boston Common has seen its share of history. Found in 1634, the Common has been host to Revolutionary British soldiers, the epicenter of celebration for independence, home to anti-slavery meetings during the Civil War, public assembly, war memorials and much more. It's these moments and these events that have built a character true to the heart of Boston's history. It's that character that has locals and visitors returning to this park time and again. 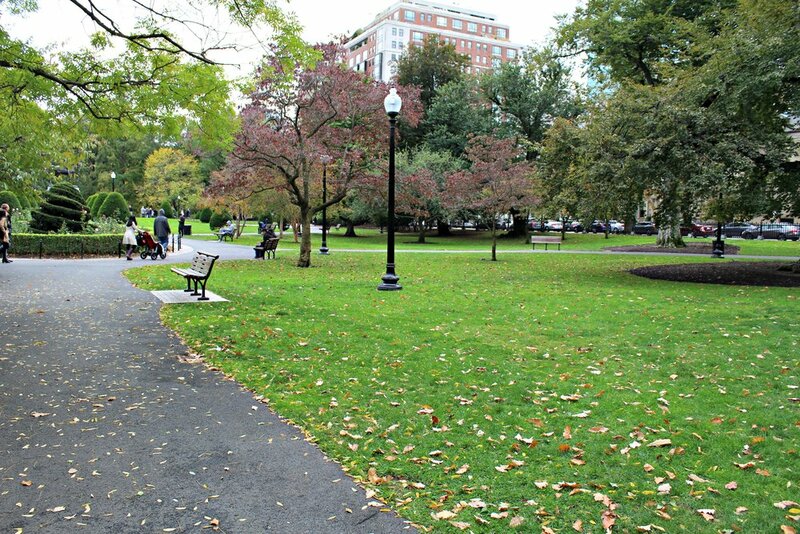 Bordering the Beacon Hill, Back Bay and Downtown neighborhoods, the 50-acre park includes kiddie areas, a frog pond, ball fields and plenty of greenery. Boston residents turned it into the park known and loved today in the 19th century. Since then, conservation groups and historical organizations have kept it well-preserved. Think of it as the Central Park of Boston. To the naked eye, it doesn’t seem so large. 50 acres isn’t too bad, right? WRONG! It’s huge! I entered through the Beacon Hill side and exited out of the Downtown side. What was originally planned to be a quick afternoon stroll turned into a three hour adventure. I couldn't resist taking photos of the gorgeous trees as they turned colors in the peak of fall. Statues and sculptures are on display throughout the park as well, many of them marking an important public figure or activist. Fountains had turned off for the season which gave a few of them a haunting feel. Walking around, you can feel the history. It’s in every leaf, in every blade of grass. In envelops you with every step. Walk through the common to get a taste of how Boston locals use it. Enjoy a picnic on the green. Say hello to wildlife because they’re no strangers to humans. I got a few close-ups of squirrels and even saw a bird land in someone’s hand. There’s not much more to say regarding the Boston Common so I’ll let the photos finish the story.